Garcia et al. 2014. Flower and Fruit Availability along a Forest Restoration Gradient. Biotropica. Frugivores and pollinators are two functional groups of animals that help ensure gene flow of plants among sites in landscapes under restoration and to accelerate restoration processes. Resource availability is postulated to be a key factor to structure animal communities using restoration sites, but it remains poorly studied. We expected that diverse forests with many plant growth forms that have less-seasonal phenological patterns will provide more resources for animals than forests with fewer plant growth forms and strongly seasonal phenological patterns. We studied forests where original plantings included high tree species diversity. 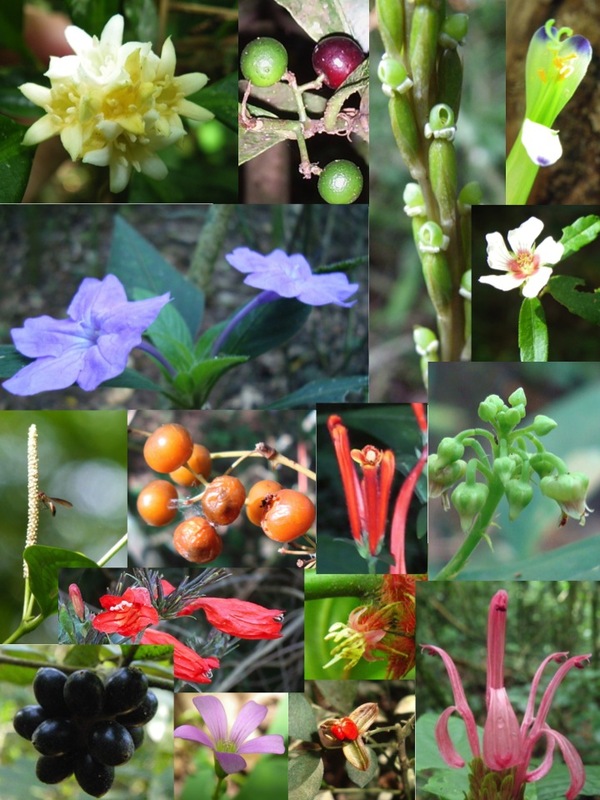 We studied resource provision (richness and abundance of flowers and fruits) of all plant growth forms, in three restoration sites of different ages compared to a reference forest, investigating whether plant phenology changes with restoration process. We recorded phenological data for reproductive plant individuals (351 species) with monthly sampling over 2 years, and found that flower and fruit production have been recovered after one decade of restoration, indicating resource provision for fauna. Our data suggest that a wide range of plant growth forms provides resource complementarities to those of planted tree species. Different flower phenologies between trees and non-trees seem to be more evident in a forest with high non-tree species diversity. We recommend examples of ideal species for planting, both at the time of initial planting and post-planting during enrichment. These management actions can minimize shortage and periods of resource scarcity for frugivorous and nectarivorous fauna, increasing probability of restoring ecological processes and sustainability in restoration sites. The sites in São Paulo (Brazil) where the research was done had some truly spectacular plants in them, whose flowers you can see in the photo montage below.